That drew Canada level at 1-1 after Japan’s No. 1 Kei Nishikori had defeated Peter Polansky 6-4, 6-4, 6-4. The latter result was something of a formality, with world No. 18 Nishikori a strong favourite over the No. 135-ranked Polansky, a former doubles partner of the Japanese from their junior days (2006 Australian Open semi-finalists) and a late substitute by the Canadian team after Milos Raonic withdrew with an ankle injury. Dancevic knew when he took to the court in the Ariake Coliseum, with its 10,000 seats about two thirds full, that a loss would pretty well end any Canadian hopes of winning the tie because Nishikori is close to a lock to give Japan another point in the reverse singles on Sunday. Things did not look promising when Soeda broke Dancevic’s second service game of the match and soon led 4-1. The wiry, wispy Soeda was feeding off the Dancevic pace and putting on a spectacular display of flashy shotmaking. But Dancevic subtly changed tactics, hitting more rounded, off-paced ground strokes and mixing in low slices to break up Soeda’s rhythm. It gradually began to work – combined with effective kick serves high to the backhand – as Soeda cooled off and Dancevic assumed the ascendency. From 4-1 down, he won five straight games – turning around the set and wrapping it up in 38 minutes. The second set was close – with Dancevic saving a break point with an ace when he trailed 3-2. It then went to a tiebreak which Dancevic broke open with a huge backhand-down-the-line winner to get the mini-break to 3-1. That was accompanied by a loud, celebratory shout of “c’mon” from the 29-year-old from Niagara Falls. Soeda took a break and left the court at the end of the second set. But it didn’t really help as Dancevic saved two break points in the opening game of the third set and then broke Soeda’s serve in the second. He looked to be tiring a bit, so his service hold – from love-40 – at 3-1 was big. After Soeda missed a forehand on the first break point, fabulous Frank proceeded to hit consecutive aces of 202 km/hr, 203 km/hr and 206 km/hr. But he still had to save a fourth break point, which Soeda failed to convert when he missed wide with a passing shot. After that, Dancevic was home free, not losing another game. It was a thoroughly professional effort by Dancevic. He maintained his cool despite Soeda’s hot start and used a mixture of tactical savvy and timely execution to get the win – one that bore similarities (although with not quite the sustained excellence) to his 6-1, 6-2, 6-2 victory over Marcel Granollers in Vancouver in the opening round of Davis Cup a year ago. “It’s funny, because Marty (captain Laurendeau) was trying to keep me in that zone,” Dancevic said referring to the Granollers masterpiece, “trying to just keep me calm and remember what I did well in that match last year – to stay aggressive. And to just stay focused and not think too far ahead. As soon as I slipped a little bit in the match, he (Soeda) was playing well. For some Canadian fans, the day began with a pep rally (above) and, their enthusiasm raised, they did not let up once they arrived in Ariake and were positioned just a few rows up from the Canadian bench. Part of their energy may have been fueled by certain libations, but they were never really out of control while maintaining a loud, constant, Canadian partisan presence in the arena. I had been told on Friday morning that a Japanese crowd was once reprimanded in an arena for not cheering enough for the opposition. On this day, the sustained support from the Canadian fans – only a few times – seemed to get to the super-polite and restrained Japanese spectators. And either there would be a rare reaction from someone in the crowd, or everyone would just try to cheer a little louder with their ITF-provided cheer sticks. 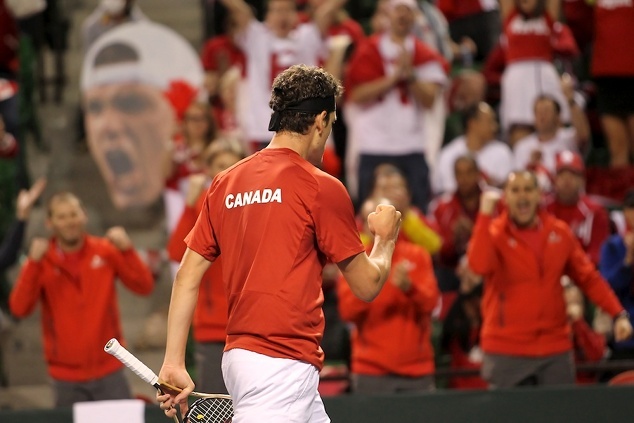 During the Polansky match, the Canadian supporters – with Tom Pospisil (brother of Vasek) as a drum major and one of the leaders – would chant “Pirate Pete,” adding a gruff, cantankerous Pirate’s “arrugh” at the end. The first time that one came out in a women’s voice, Dancevic heard it and smiled. Later he would laugh and say, “I was hearing those chants, it put a smile on my face. It actually kept me pretty relaxed through the match. Bernice, Maybe you are not getting enough food intake in your system? If so, try to work through it. If you are not use to working out then it’s just your body is telling you to stop. Don’t stop.